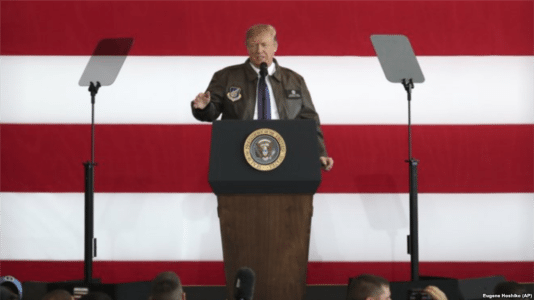 President Donald Trump and first lady Melania Trump visited the Yokota Air Base in Japan, thanking the United States Armed Forces for supporting American values around the world. “You are the greatest hope for people who desire to live in freedom, and you are the greatest threat to tyrants and dictators who seek to prey on the innocent,” Trump said. The president did not name specific leaders in Asia, such as North Korea, but alluded to their dim future. Trump praised the United States military, promising to give them the best equipment and resources to do their jobs. “We dominate the sky, we dominate the sea, we dominate the land and space,” he said. Trump promoted the success of the United States under his leadership, citing strong economic numbers since his election. He also commented on the ongoing fight against Islamic State terrorists. “We’ve dealt ISIS one brutal defeat after another, and it’s about time,” he said. Lieutenant General Jerry P. Martinez, the commander of the U.S. forces in Japan, presented Trump with a new flight jacket, which he exchanged for his suit coat. “I like this better,” he said to the cheering audience. The president visited the base as part of his 10-day trip to Asia. During his flight aboard Air Force One, one reporter asked what his message was to the North Korean people.